Home Research Faculty Michael Kilberg, Ph.D. Professor Michael S. Kilberg earned his Ph.D. in biochemistry and molecular biology. He did post-doctoral studies at the University of Michigan, before joining the faculty at UF. 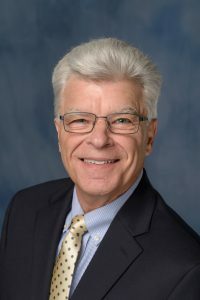 He has written numerous reviews, organized several symposia, and written multiple chapters for both the Annual Review of Nutrition and the Annual Review of Biochemistry. Dr. Kilberg has served three terms on the Editorial Board of the Journal of Biological Chemistry. Dr. Kilberg has received the University of Florida Doctoral Advisor/Mentoring Award, the College of Medicine Faculty Research Award, and a University of Florida Research Foundation Professorship. We are investigating transcriptional and epigenetic regulation of human genes in response to protein or amino acid limitation, a stress that activates multiple signaling pathways collectively referred to as the Amino Acid Response (AAR). Genomic analysis of the human genes for asparagine synthetase (ASNS), activating transcription factor 3 (ATF3), and cJUN, has allowed us to characterize these AAR signaling pathways, the genomic cis-acting sequences that act as amino acid response elements (AARE), the corresponding AARE-associated transcription factors, the assembly mechanisms of the general transcriptional machinery, and the epigenetic changes within the target genes. The results have led us to focus on the genomic control of the genes for the nutrient-responsive transcription factors themselves, to understand the mechanisms for “regulation of the regulators.” Principle among these are the transcription factors ATF4, ATF3, C/EBPs, and cJUN/cFOS. Whereas induction of ATF4, a “master regulator of nutrient and ER stress” appears to occur ubiquitously, activation of an amino acid-responsive signaling pathway involving the JUN/FOS transcription factor family is preferentially activated in certain transformed cells. Deciphering the sensors for amino acid availability in tumor cells, identifying new signaling pathways, and characterizing the downstream target genes are current areas of interest.